This article is based upon a question asked by Chandra. This is a common requirement. I have multiple pictures and I want to show one picture per slide. Needless to say, most of us take the laborious and inefficient path of adding one slide and inserting a picture repeatedly. As always, there is a better way. The sad part is that this method is available for at least 15 years! Make sure all the required pictures are in the same folder – it makes this easier to select them. Now almost all options are inactive because there is nothing to edit. Don’t worry. That’s it. The presentation is ready. Usually picture centric presentations tend to be too heavy on size. So here is how you minimize the size. First, save the original slide show. 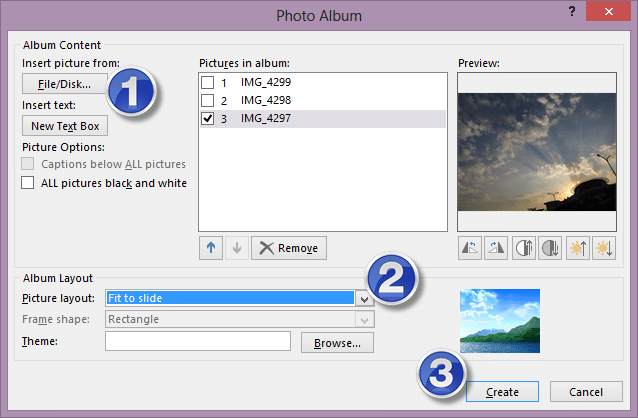 Click on any picture – in Picture Tools – choose Compress Pictures button. Remove the checkbox from Apply only to this picture, choose 96 ppi resolution and Compress. This way ALL the pictures are compressed in one go. Now save the presentation as a copy and compare the file sizes. If the photos are already compressed then you may not achieve significant size reduction. Remember that the Photo Album has a dropdown which shows another option – Edit Photo Album. So if you feel like changing anything from the album, don’t discard the current one and create a new one. Just go to edit, change the desired option and choose Update. Look at the Photo Album button. This is a composite button. It has upper part which does the action – creates photo album and lower part which shows a dropdown and more options. Notice such buttons. Previous PostExcel data cleanup with Flash FillNext PostWhat is OneNote? Spend 4 min to find out! Thank you for the amazing answer provided for my question Sir.